Tired of the same, overblown art frenzies this time of year? Then forget Miami. Or at least get a new leg on your ticket. The place to be is New Orleans, about as un-Miami as you can get these days. Yet not so far! Their new biennale of art is called Prospect.1 and it's based on a premise brilliantly conducive to good art. It's set in a city where the pressures of money have not completely pushed art out of the magnificent spaces within its borders. It is set in a city with more artists per capita than any other United States city. It's set in a city that is not very large, yet is still blissfully full-on urban. But don't take my word for it. Roberta Smith did a great piece on it for the New York Times a month ago. 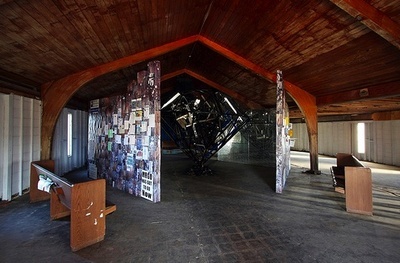 She notes that the artworks are scattered, not centralized, so they're always being looked at in their context, and the trip to see them creates a powerful exploration of New Orleans at the same time. And more interesting, Tropolism friend John D'Addario is the official installation photographer, and his flickr set of the installations is priceless. 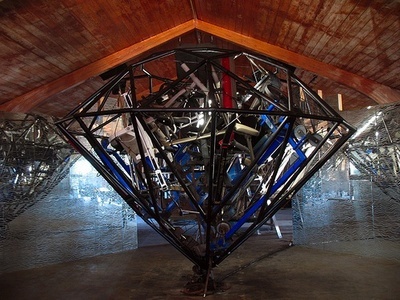 Pictures are of one of our favorites, Nari Ward’s “Diamond Gym," filled with weightlifting machines. Time to txt your travel agent.